Just installing my new virtual instrument library (just bought EastWest Hollywood Orchestra). dayum it sounds nice. 700 GB tho. Kwerty, Finnuval and Marsigne like this. Final little personal project before exams: Christmas theme variations! As always your music is a joy to listen to. Thanks! This one is a bit harder and longer since I'm going for a more classical approach, meaning I plan more carefully voices and harmony and make them more complex. Nice! Now let's defeat the boss. @MushroomCake28, I just say that what is your style. Everyone has their speciality and their likes. That is people listen to different music. @MushroomCake28, I agree with you that music is very important for create a game atmosphere. If I pick a wrong music, I maybe ruined game player's experience. Actually a good idea to make the "hits" and "target" blue (it's more like I forgot). As for the bottom left window, I'll try stretching it more, but some skills have like 5 elements and require some space for the 5 elemental ions. Yes, it looks much better compared to the previous one to me. I will be needing some testers for my demo. Anyone who got some free time interested? Just a little warning, the demo is about 3-4+ hours. No, the project recruitment thread would be separate from your project in development thread. Though if you have a game thread already, you could mention in a post there that you could use some more feedback. Alright thanks! Will do that soon. Kes, Finnuval, TheoAllen and 1 other person like this. My fave part is "Never be clever for the sake of being clever"
OnslaughtSupply, Finnuval, l8rose and 1 other person like this. Why are you using a blender to render animations? Because I created the scene in blender lol. We, proud Canadians, don't always say sorry. I'm sorry if you are shocked because of this new discovery. Matseb2611, JGreene, CxNxRx and 1 other person like this. I'm sorry, did I hear that right? Did you just say sorry? To me? You're going to be sorry! Your demo is very long. Is your full game 100 hours? @Kupotepo Honestly I haven't tested it all lol. Will probably be about 30-40 hours of main story gameplay, but who knows with all the side quests and the after story gameplay (where the real challenge begins). I am not complaining about the length of your game. I like it. Me when I'm bored: keeps refreshing the forum's page for something interesting. Then I think "where's everybody?!" We are sleeping while you are refreshing the webpage. We live in a different timezone. Although it is very cool, I would be way too worried about my piano to do this. Working on the Rachmaninoff piano concerto 2. Hard, but it's very fun to practice and play. Always Steinway grand piano. Well it's kind of a family tradition to have one, so I guess I had no choice lol. Nice. One day I'll have to get me a grand piano. Nowhere to put it--but one day. A short composition, it's a theme for a kind a group of pirate/thieves called the "Black Stars"
Kwerty, Guiguimu, Finnuval and 1 other person like this. It's a bit more 'dance macabre' then piraty imo but I love it ! Composed this a while ago, but never too late to share. Music for a crystal cavern dungeon. Poryg, samkfj and Finnuval like this. Thanks haha! I got a couple others I haven't post yet, I'm keeping them for the next few days lol. It's been a long time, but here's another composition! Boss Theme! Great work on teasing out the theme on the brass and strings on the first round and again with the woodwinds and brass after the bridge. Also, the modulation (back to B?) around 2:39 is also nice - keeps it fresh. Again, nice work! I couldn't help but notice your last post about 444 likes... ...and the fact that your YouTube song length is 4:44!! dragoonwys, samkfj, Finnuval and 1 other person like this. @TWings Hmm great question. I'll go with 4 as bad luck, but you get only half the bad luck. The other half comes from 13. RIP Stan Lee I hope they managed to film his scene in Avengers 4 before he died. Yeah, we lost one of the great ones. Ohh, hope you guys all feel better soon! @TheoAllen yeah. The event that runs that script command. Just tweak my battle enemy AI. Since I use a semi-tactics battle system, enemy used to always target the area with the most actors in it. Now, they have a higher chance of targeting areas with higher number of actors in it, but they can also decide to target a single actor. That second approach sounds really intelligent. A simple, yet effective and sufficiently unpredictable, method for determining enemy targets. Yeah, I figured it out while play testing. 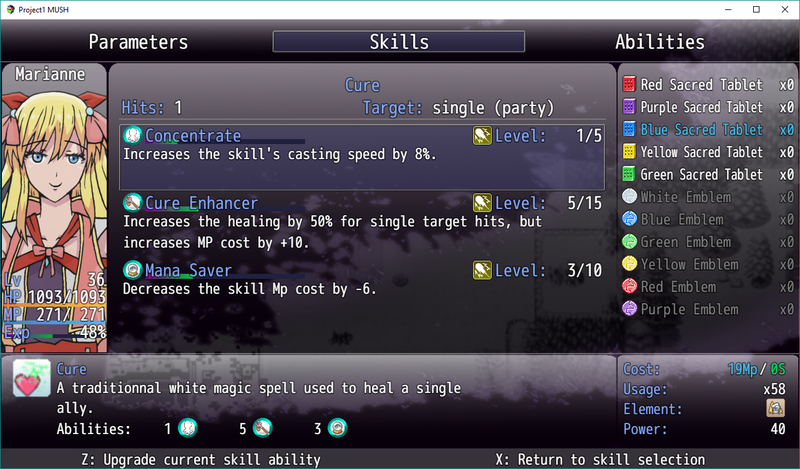 I could place strategically my characters in a certain way so that enemies will always target the same group with AoE spells.